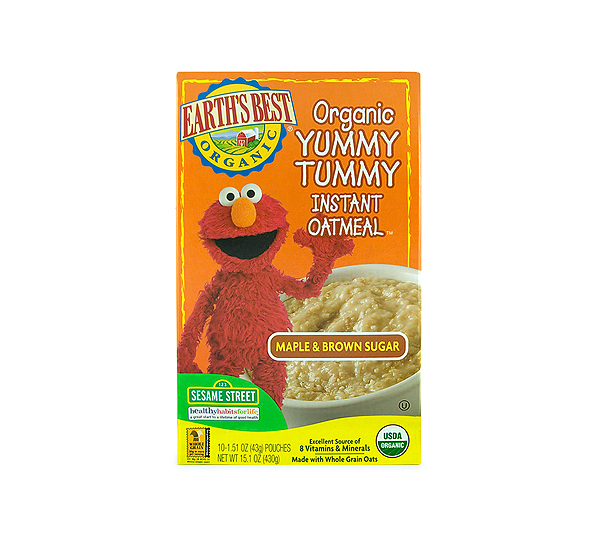 Today’s review… Earth’s Best Yummy Tummy Instant Oatmeal in Maple & Brown Sugar flavor. Now that the weather is inevitably getting colder (I’m so not happy about the cold weather! ), what better than to have a nice warm bowl of oatmeal? 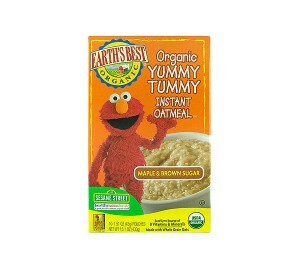 Aside from the catchy orange box, this oatmeal had Elmo from Sesame Street on it. I am a kid at heart, and well, how could I not like a product with Elmo on the box? According to the website, here’s some quick facts about this oatmeal. I couldn’t wait to try it- one of my favorite flavors for oatmeal was brown sugar and I also adore the flavor of maple! So I made the oatmeal, poured in the hot water, let it cool and gave it a taste. The verdict? Not bad! It was a creamy oatmeal, that gave a decent sized bowl. I loved the fact that there was added vitamins and minerals, and four grams of fiber per serving. However, I thought it really wasn’t that sweet. There was eleven grams of sugar, so I was imagining it to be at least a bit sweeter than it was. However, I’m sure the mild sweetness could easily be enhanced by an extra sprinkle of brown sugar or some stevia, or even some fruit. Otherwise, I enjoyed the oatmeal, and I’m giving it 4 stars. 1 packet is 160 calories, 2.5 grams of fat,32 grams of carbohydrates, 4 grams of fiber, 11 grams of sugar and 4 grams of protien. Macaroni & cheese anyone? Who, honestly, can resist mac & cheese!? This sinful dish is often gooey, cheesy and delicious, but also often packed with sodium, artificial colors and fillers. But not this mac & cheese! Earth’s Best Elmo (yes, ELMO!) Mac’n Cheese is all natural, with 22g of whole grain per serving. Yes i admit, it’s probably aimed toward kids, but who says “older kids” can’t enjoy it as well? Plus i’m a sucker for portion size! This Mac & Cheese comes with a side of carrots and broccoli for extra nutrition. 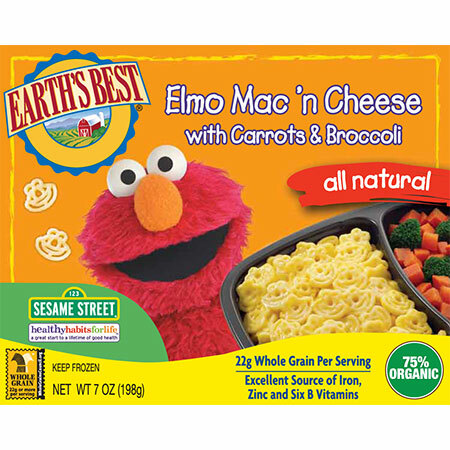 If you look on the box, you will see, yes, the macaroni is in shapes of elmo’s face. Cute! I was excited to try this, i love macaroni & cheese, but we all know how easy it is to overdo it. So how does this meal live up? Well, this is real macaroni & cheese. No fake boxed crapola, no cheese “powder”, no dyes. This uses REAL cheese, REAL milk. So, it tastes like REAL macaroni & cheese! It’s very creamy, cheesy, and buttery tasting. The cheese adheres well to the elmo pasta, which is cooked nicely, not mushy but not too hard either. There’s a pretty generous portion of pasta in this meal too, i thought it would be a itsy bitsy amount of pasta, but nope, there are a lot of cheesy elmo faces ready to be eaten. As for the veggies, i would have liked more. The broccoli is not big at all, rather chopped up in little bits. The carrots are good though, soft and sweet. It’s a good compliment to the mac & cheese, but i wish there was more. To make it more filling i added an extra serving of vegetables and had some protein with it as well. As for the nutrition, it’s pretty good! It’s 220 calories, 7 grams of fat (YES, SEVEN, and it’s made with REAL ingredients! ), 33 grams of carbs, 5 grams of fiber, and 9 grams of protein. I was happy that the first ingredient was whole grain durum wheat for the pasta, not blanched wheat/refined flour. Yay! It’s also enriched with extra vitamins and minerals, like B vitamins, etc. The only cons for this meal that i have is it skimps a little on protein (but as i said, i just had a little extra to round this out and make it more of a meal for my size), and it has 4 grams of saturated fat, probably from the heavy cream , cheddar cheese and butter oil in the ingredients. But most macaroni & cheese has about that amount of saturated fat, and at least this fat is from real cheese & butter and not fake stuff.. So if your craving mac & cheese, this will help your craving without helping your waistline fill out. Give it a shot- and enjoy the cute little elmo faces! Organic Elmo Pasta (Organic Whole Grain Durum Wheat, Organic Durum Semolina, Vitamins & Minerals [reduced iron, niacinamide, zinc oxide, riboflavin, thiamine hydrochloride, pyridoxine hydrochloride, folic acid, cyancobalamin]), Cheese Sauce [water, heavy cream, cheddar cheese [cultured pasteurized milk, salt, enzymes, annatto color], nonfat milk, corn starch, butter oil, enriched wheat flour [flour, malted barley flour, niacin, reduced iron, thiamin mononitrate, riboflavin, folic acid], sea salt, natural flavor, torula yeast, xanthan gum, annatto color), Organic Carrots, Organic Broccoli.